sliced and piled high on toasted bread to make delicious sandwiches that the whole family will love! My kids have always loved sandwiches, especially my oldest son. Put anything between two pieces of bread or a bun and he's one happy guy. Whether I grill chicken, make a pork tenderloin, or even make a pot roast, he loves it more if it's made into a sandwich. Who can blame him? You can pretty much turn anything into a sandwich and it will rock! A couple of weeks ago I picked up a gorgeous Certified Angus Beef brisket flat from my local Meijer store. 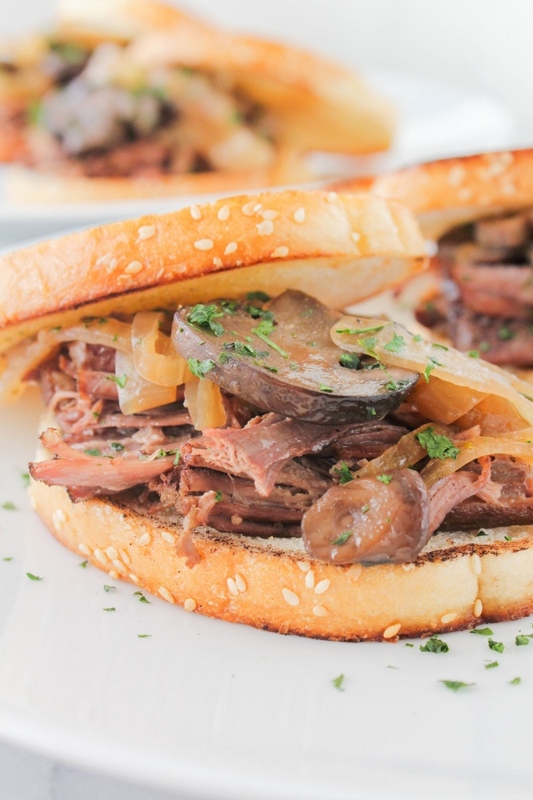 I wanted to create a sandwich that was hearty and full of flavor, so I slow cooked the brisket in the oven with beer, onions, and mushrooms. Of course there were a few other ingredients, but those were the main components. After three hours in the oven, my knife sliced through the brisket with ease. The crust was nice and crispy from the searing while the inside was tender and juicy. 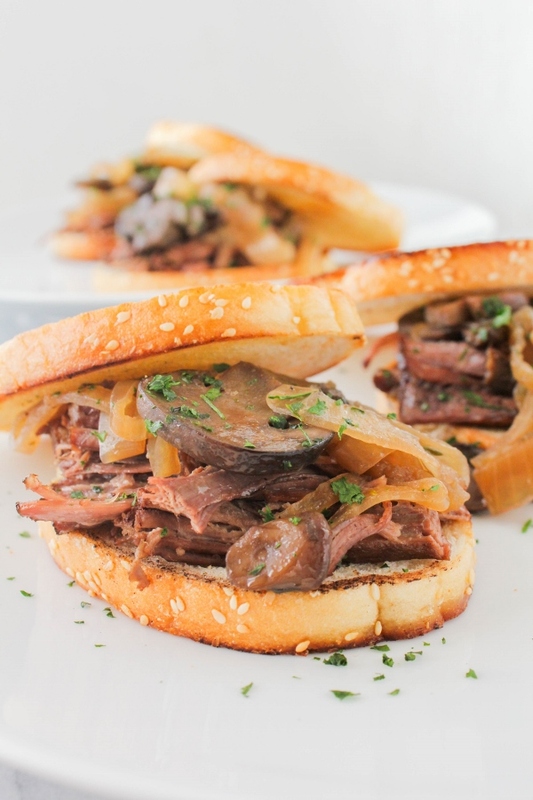 I lay slices of the meat onto the toasted bread and topped them with onions and mushrooms, followed by a sprinkling of fresh parsley. I also turned the cooking liquid into an au jus which is perfect for dipping the sandwiches in. These sandwiches are perfect for a family dinner, but are equally as impressive to serve to a crowd. The prep is quick and the oven really does all of the work for you, so this turns out to be a fuss-free, stress-free meal. Preheat the oven to 325 degrees. 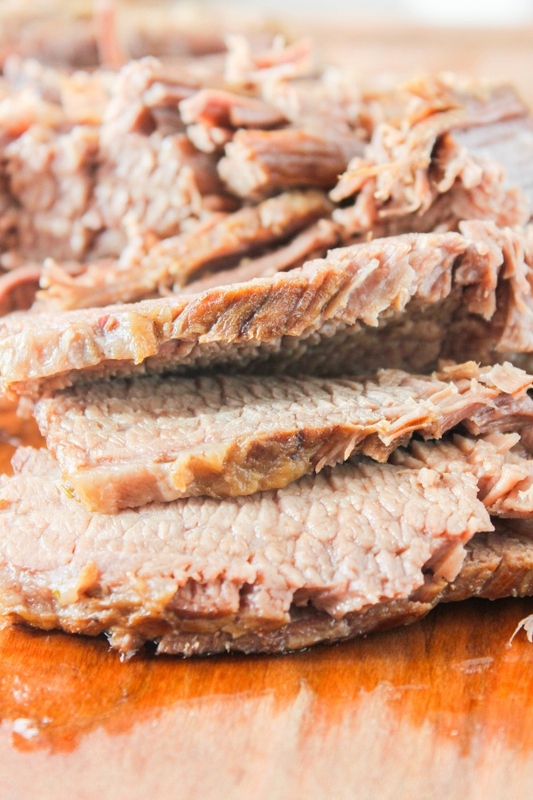 Remove the brisket from the packaging and pat it dry with paper towels. Sprinkle all sides of the meat with salt and pepper. Add the oil to a large Dutch oven over medium-high heat. Transfer the brisket to the pan and sear on all sides. Add the stock, beer, onions, mushrooms, and garlic and bring to a boil. Cover the Dutch oven and transfer to the oven. Bake the brisket for 3 hours, or until the meat is tender. Remove from the oven and let it rest for 15 minutes, uncovered. Transfer the brisket to a cutting board and slice the meat across the grain. Remove the onions and mushrooms from the pot. To make a simple au jus, skim the fat from the cooking liquid. Bring the mixture to a boil then reduce the heat and simmer for 15 minutes. Season with additional salt and pepper, to taste. 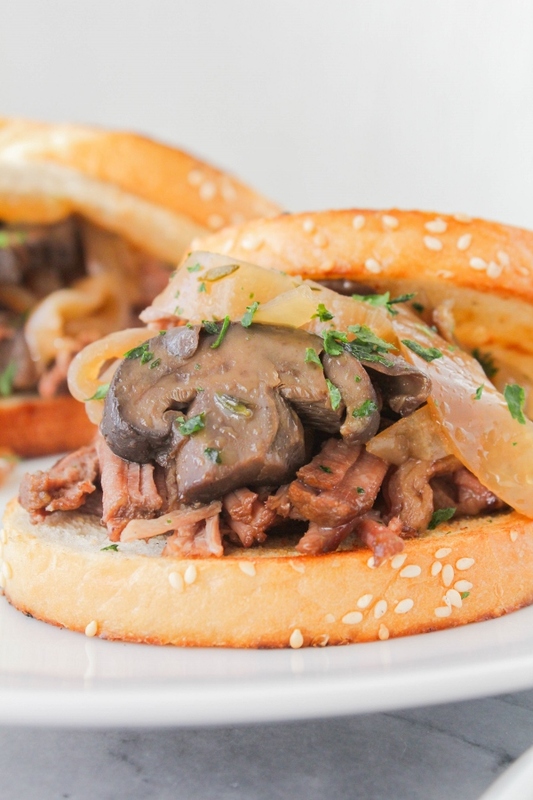 Place slices of the brisket on half of the bread slices, topped with some of the onions and mushrooms. Sprinkle with the chopped parsley, then add the tops to the sandwiches. Serve with a side dish of au jus. Do you love beef as much as I do? Join the Certified Angus Beef ® Kitchen on Facebook where you'll find expert tips, advice, recipes and more in a beef loving community made just for you! I am honored to be a Certified Angus Beef ® brand Ambassador and am compensated for my work with them. Developing this recipe and sharing this post was not required, but something that I chose to do. All opinions, as always, are my own.